Legends of the Seas is a recent release from Novoline by Novomatic. It’s a 5-reel video slot all about the legends of the seas! There are many myths and legends associated with the world’s seas. There are scary legends, like the Kraken, and there are magical legends, like mermaids, mermen and the lost city of Atlantis! Legends of the Seas has 40 paylines and many of the symbols and the artwork celebrates the legendary! An Atlantean King stands to the left of the reels and they only spin when he wields his magic trident. You’ll also see mermaids in this video slot game! Legends of the Seas has a Free Spins round you can win, and the wins go wild in this feature. You can play Legends of the Seas for real money at several Novomatic casinos. To help you decide which Novomatic casino is right for you, we’ve reviewed a selection of the most popular online casinos that offer Novomatic games. Our reviews cover the games, security, support, payments and promotions. That way, you’re fully informed before you sign up somewhere. Much like our game reviews, we try to give you as much information as possible and to tell you how it really is. 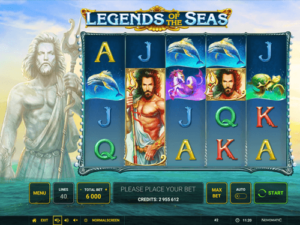 For other Novomatic slots like Legends of the Seas, see: Almighty Reels Realm of Poseidon, Lovely Mermaid, Lord of the Ocean, Mermaids Pearl and Mighty Trident. To get a payout in Legends of the Seas, you will need to match a minimum of three symbols, consecutively along a payline. This is a one-way slot so the matching symbols must line up from left to right. To view the payouts you can win for your bet, you must open the paytable. This displays all of the symbols in detail and shows the payouts for 3, 4 and 5 matches of every symbol. The Jack and Queen symbol payouts are the smallest. On the other hand, the Atlantean and the mermaid symbol payouts are the biggest! The mermaid is a very beautiful creature and she has flowing blue hair. In addition to the Jack and Queen, there are two more card value symbols: the King and the Ace. The other picture symbols are: the seahorse, the turtle and the dolphin. All of these are magical in some way or another, as if they come from another world! Classic Novomatic slots noises can be heard when you match enough symbols in the right positions for a win! When you are playing manually, you can choose to collect or gamble each win. If auto mode is on, you must end this mode before you can use the gamble feature. Legends of the Seas has a Wild symbol which many players will be familiar with! It’s a great symbol to have in a slot game because it essentially gives you an extra chance to get a win when it lands in the right position(s). This Wild can be a substitute for all symbols in the game, except for the Bonus symbol, the mermaid symbol and the Atlantean symbol. This is a Novomatic slot game with a legendary bonus. The Atlantean King and the mermaid can both appear as stacked symbols (covering an entire reel). He appears on reel 2 and she appears on reel 4. They have a romance blossoming and if they land on the reels at the same time, they will come together to award you the bonus! The bonus consists of 10 Free Spins which you play immediately after you trigger them with the two stacked symbols! During the Free Games, there’s an extra symbol that’s added to the reels that’s born out of the love of the Atlantean and the mermaid symbol! This symbol shows the two characters in a passionate embrace and it’s also stacked (covers an entire reel). It’s a Wild symbol and it will only ever appear on the middle reel, to signify the coming together of these two mythical sea creatures! When it lands in full view (covering the entire middle reel), the slot will award you two more Free Spins which will be added to your 10!